We’d love your help. Let us know what’s wrong with this preview of Mystery at Shadow Lake by B.L. Hoffman. 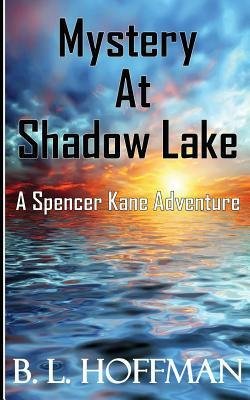 Spencer Kane, a teenager on vacation with his family at Shadow Lake, Michigan, finds himself in the middle of peculiar, even paranormal situations that affect many of the lake residents. Spencer and his friends unknowingly cause the events to intensify and become more violent, bringing even more danger to those who haven't yet fled the lake in terror. To ask other readers questions about Mystery at Shadow Lake, please sign up. This book is a thriller in the finest sense of the word. It is also a serial, in that it ends with a 'to be continued.' While that will have me coming back this time, I hope it doesn't take too many books to find the solution. Spencer Kane, seventeen, is a normal boy looking forward to the family's annual two week vacation at the lake house. Shadow Lake, Michigan is a popular vacation spot and many families have chosen to buy their vacation homes there so, everyone knows each other fairly well. So This book is a thriller in the finest sense of the word. It is also a serial, in that it ends with a 'to be continued.' While that will have me coming back this time, I hope it doesn't take too many books to find the solution. Something is different this year though. First of all the Martin's have found trenches dug around their home. A couple might have been done by the water company...but? Teenagers being teens, Spencer tries to impress Angela Martin and her friend, Cassie with exploring the trenches with them. Very quickly the scene turns dark and troublesome. The trio digs out some artifacts and Spencer takes them home with him until they can clean them up and check into them. Yes, I did yell at the book and tell Spencer, "What are you thinking of?" but he kept me turning pages to find out what happens. Author, Hoffman knows her craft and how to keep her audience stuck to their seats. The description of fishing and the atmosphere of the hospital were intricate and you felt like you were with the characters. Yet, she keeps it simple just like a seventeen year old would. I did not like this book. The writing did not flow well and most of conversation felt forced. People spoke in a way that is not entire realistic. Also, I did not like the ending. The story is going and then all of sudden the book is over. It could have ended on a better note and lead into the next book a little more smoothly. I don't like it when you have to get another book to finish the story. A book should stand on it's own. That is not to say that there can't be additional books. I am the author of this book, so of course I like it! This is the first in a series called the Spencer Kane Adventures. The book was not specifically written for young adults, but I've been told the book is perfect for their age group...in addition to adults. FREE Offer - The e-book version can currently be downloaded for FREE from Amazon, B&N and Smashwords. This is the first time I've added a book to Goodreads, so I'm not sure if I'm doing this correctly. I'm sure someone will let me know! Pl I am the author of this book, so of course I like it! This is the first in a series called the Spencer Kane Adventures. The book was not specifically written for young adults, but I've been told the book is perfect for their age group...in addition to adults. Please give the book a try. I look forward to reading your reviews. I really enjoyed this book. From the adventure of a dug up backyard to the police station to find out about the Native land I loved it. I didnt want to put it down. Cant wait to read the next one! I just finished Escape from shadow lake i loved it as well but i dont really like the brief enddings the books have but hey i never wrote a book before i just wanted to say they are short and sweet and now i have to wait to read book 3. Thanks again for the free copy of Mystery at shadow lake! I seriously can't decide about this book. I did like it and it was a easy and quick read. It also kept my attention pretty well. What I didn't like is that it played the adults as idiots and having to tell their child Spencer as though he was the adult and their protector. I realize the the book is a Spencer Kane adventure, but it just plays on that adults are fools and only he can save the day. I felt like the storyline had potential, but the writing style felt very young and forced. I admittedly stopped before getting through the first chapter because the writing style just didn't hold my attention. Horrible ending ... Such a long drawn out book to have such a poor ending. Paranormal mystery. Dialog a little juvenile and stilted. Mystery was not solved. You have to read the next book. Don't think I'll bother.